I am allergic to nuts. Usually, my reactions are manageable with orally-ingested, over-the-counter antihistamine. I've never gone into anaphylactic shock. I do get hives, my salivary glands go into overdrive, I get itchy all over, and sometimes it requires, even after taking antihistamine, that I regurgitate whatever I ate. Even the smell of certain nuts can trigger a mild reaction. I think walnuts and almonds are the worst. If I eat a cookie that is picked up with a utensil that had been used with nuts, I may have a reaction. When I was a kid, I could eat a Tofiffay® by eating around the hazelnut, and I wouldn't react. Today, I wouldn't think of doing such a thing. I remember that chocolate bars such as Coffee Crisp or Kit Kat had hazelnuts in the ingredients and I could eat them, but I'd get a very small reaction that didn't even require antihistamine to tolerate. Hazelnuts have since been removed from the ingredient lists of both products. A few years ago, I had a reaction that nearly closed my throat, the first such reaction in my 35 years (at the time). Last year, I ended up in an ambulance. I was advised that there is no way to predict how I might react and that my history was no indicator of what to expect in the future. Yes, I could experience life-threatening shock, so I was prescribed an epinephrine injector. My question is: why can I eat peanut butter? Let's clarify that question. We're talking about smooth commercial peanut butter. I will not eat crunchy peanut butter, nor will I even attempt natural, freshly-ground peanut butter from a healthfood store. Let me drill down the focus of the question: what is in a nut (and I don't care whether a peanut is "technically a legume" for the purpose of this discussion), that is not found in a commercially prepared butter? 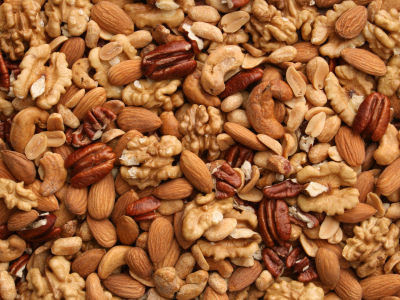 What I fail to understand is, with children dying from nut allergy reactions, why is there so little research in truly understanding more of what's going on? Should it not be a simple enough exercise to analyze the particle content of a peanut and then compare against the content in peanut butter, isolate what's present in the butter that's not in the peanut, what's present in the nut that is absent in the butter...OR, what is in both but different? That would suggest, in my simple mind, that the allergic agent is not the whole nut itself, but something IN the nut that is somehow either modified or altogether removed when processing for a commercial butter. Shouldn't the food services industry and health care institutions be looking for concrete answers (if even for the basest purpose of expanding the market to whom they can sell product or reducing the overload on health care services)? Wouldn't answers to these questions also derive an added benefit of shedding some light on other food allergies, such as to shellfish, or strawberries? There is so much that we don't know, it makes sense to keep pushing to grasp what we can know - this kind of knowledge can save lives. And, I can readily appreciate that we have arrived at an elegant work-around - I try to avoid foods with questionable ingredients or situations where cross-contamination can occur, and I have antihistamine and steroids available should I be unsuccessful in my avoidance efforts...but there's a wise old saying that I suggest may be appropriate here: "an ounce of prevention is worth a pound of cure." I do, however, acknowledge, that my argument would suggest I'm calling for genetic modification of the nut so that the protein or other element that is the allergic agent is removed, but do I really believe that "franken-nuts" are a desirable alternative? After all, why change them and spoil the natural enjoyment for those who are not allergic to nuts? I'd only accept that if I was also willing to believe that the current situation as it is does not already have any modification happening. The very fact that I can eat certain peanut butters indicates clearly that things are already being modified, albeit "by accident". As such, I'd suggest that if we can understand what is actually happening, then we can be deliberate in how and when such modification happens.